The Act of Union in 1707 joined Scotland and England politically into one country. The result of the legislation meant that Scottish affairs became the responsibility of Westminster. Even though this was seen by many as taking away a lot of power from the country, Scotland kept several important sectors that remained entirely separate from England. There was a different legal system and also a Church that had no ties with the Church of England. In 1885, Scotland was handed back a certain amount of its administrative power in the form of the Scottish Office. This enabled the region to take responsibility for issues that were crucial to its well-being in areas such as fisheries, farming, education, law, and health matters. This powerful body was headed by the Secretary of State for Scotland. Not only was Scotland an independent country up until the union in 1707, but it was also fiercely nationalist. There was, however, a voice within the country that saw the benefits of joining with England as it was thought from a commercial standpoint that it brought economic prosperity. The first twenty to thirty years of the union saw several efforts to restore the Stuart monarchy. The rebellion of the Jacobites was centred in the Highlands and was not considered to be a movement for the whole of Scotland. In the mainly Presbyterian Lowlands, it was as unpopular with the people as it was in England. Founded in 1934, the Scottish National Party aimed at the so far elusive goal of bringing unity to the nationalist movement by merging the diverse factions. It united the pro-independence National Party, which was left wing, with the Conservative Scottish Party that's primary aim was to establish a fully independent Scotland. The first Member of Parliament for the SNP was elected in 1945. It would, however, be 20 years later before any real success took place with the Scottish electorate. In 1967 over 200,000 votes were won at local elections and the party took 40 per cent of the council elections in 1968. With the setting up of the Kilbrandon Commission, plans were laid for a Scottish Assembly with Conservative leader Edward Heath giving his promise to support it. With the discovery of North Sea oil in the mid-1970s, the SNP claimed success by winning 11 seats in the 1974 general elections. The campaign at the time "It's Scotland's oil", played a big part in gaining the seats, and there was a general feel of optimism about the way the devolution strategy was heading. 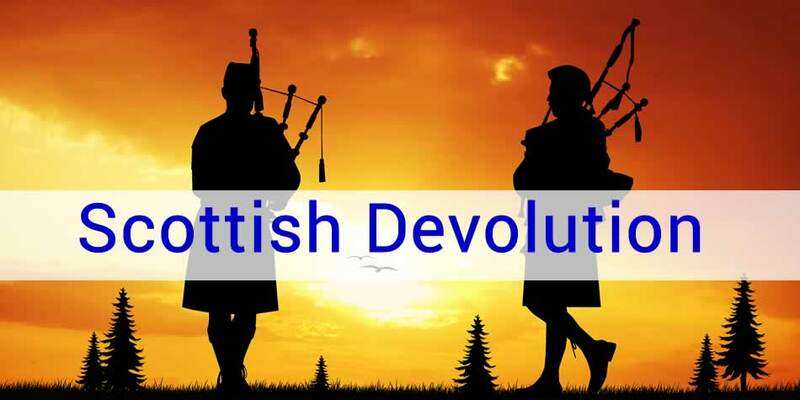 Under the terms of the 1978 Scotland Act, a provision was made for a referendum on devolution. The subsequent event saw 1,230,937 people voting in favour, but this figure did not represent over 40 per cent of the electorate to make the result legal. The referendum failure began a period of SNP decline, with a lot of in-house fighting between the various factions that were lumped together under the Scottish National Parties agenda. The Thatcher years were fallow years for the SNP, but the Labour Party placed devolution high on its agenda. John Smith's famous quote about "unfinished business" was just the start of what was to be a period of great success for the movement. A Scottish Constitutional Convention that was put together in 1988 finally called for the formation of a Scottish Parliament in 1995. When Labour gained power in 1997, the plans were delivered for a referendum in September of that year. This time, 1,775,045 voted in favour, which represented over 70 per cent. In 1999, the Scottish Parliament was established. 2007 was a historic year for the SNP with an enormous victory in the Scottish elections. It won 47 of the available 129 seats. Even though talks of a coalition government in partnership with the Greens and the Liberal Democrats fell through, the party formed a minority government with the first minister being Alex Salmond. This was followed in 2011 by an increase in seats to 69, which gave the party a majority, and the power that it had always craved for to call for a referendum on full independence. It took many months of negotiation between Salmon and the Prime Minister David Cameron before the power to hold such a referendum was granted, with the date loosely set to be held in autumn 2014. The result of the referendum for full independence was announced on 19 September. It was a 'no' victory with around 55 per cent of the vote. The important result in the 2015 general election saw the SNP win 56 out of a possible 59 seats, which was a landslide victory. This was the best outcome ever in the UK elections and under the leadership of Nicola Sturgeon; the party has managed to tap into the 'wave' of nationalism sparked by the narrow referendum defeat. Even though there is an insistence that the election win was not about independence, the leadership of the SNP have not ruled out the future possibility of another vote on Scotland's future as an independent country.